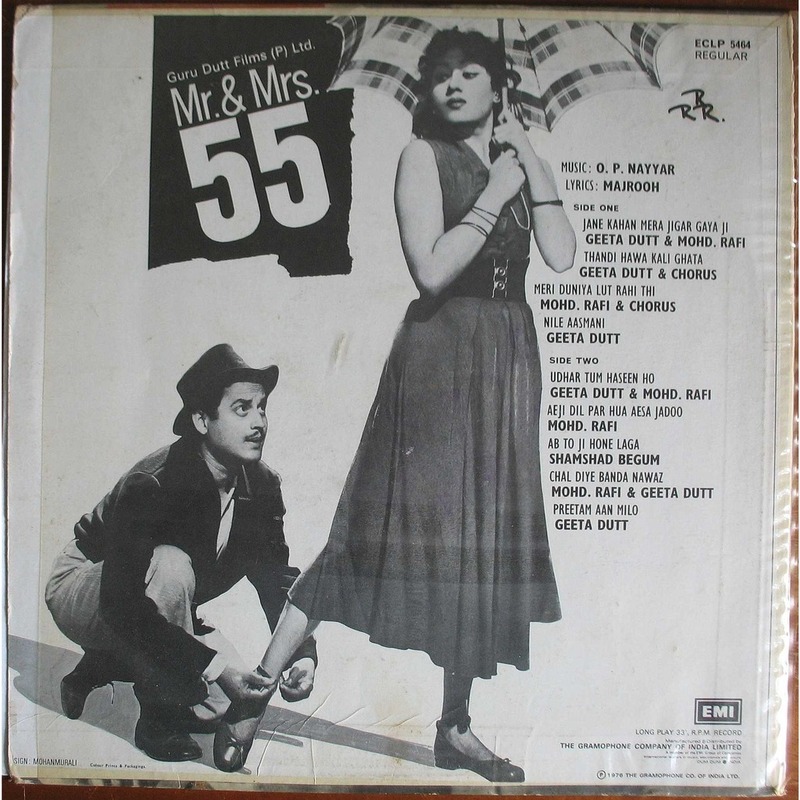 One particularly gloomy morning this week, I decided to wake myself up with songs from Mr. & Mrs. ’55. They prompted me to watch this Guru Dutt-Madhubala classic again after all these years. I remember watching it for the first time with my parents when I was just beginning to make sense of the world. The family used to watch movies together most nights, but this one stuck in my head because my mother used to refer to herself and my father as the titular “Mr. & Mrs. ’55”, courtesy the address we lived at those days. At the outset, I must warn that most people in today’s day and age will find the anti-feministic and traditionalist view of women portrayed in this film quite unpalatable. But it is important to view this film more as an artifact of the era in which it was made. Barely eight years after India became an independent nation, a need was felt by the creative community to help uphold Indian values and ensure that society found a structure. In their minds, issues like the Communist movement, a deplorable job market and the “liberal” upper class trying to reform the entire society at large without any consideration for the cultural backgrounds that support/oppose these reforms in the West/Indian subcontinent were more important to address (most of the feminism shown in this film is clearly about aping the West) . I am not in full support of the views portrayed in this film, but I like it tremendously it for its technical brilliance, the witty dialogue, the performances of the lead and the supporting cast, the camerawork, the songs and for the simple fact that it is a story told well for the milieu it is set in. The story is of a rich heiress, Anita (Madhubala) in love with the idea of romance. But her life is fiercely controlled by her feminist aunt, Sita Devi (Lalita Pawar), who considers her learnings from life in the US and Europe the ultimate life mantra, naturally, without any reference to any context whatsoever. To inherit her wealth, Anita must be married within a month of her 20th birthday. Her aunt organises a sham marriage with a brilliant out-of-a-job cartoonist, Preetam (Guru Dutt) so that an easy divorce can be filed within a few months. Unknown to Sita Devi, Preetam and Anita have met several times before and feel some chemistry with each other. Friends and relatives of Preetam (Johnny Walker, Yasmin, Kumkum and Tuntun) help him woo his miffed lady love. The obligatory confusion ensues, conflicts happen, the lovers have a spat, and are reunited at the airport (I am assuming this was the first of many times in Bollywood that the airport was used for a reunion of the “hero-heroine” jodi). This is one of Guru Dutt’s comedies as director and lead actor. While he is more popular for his tragedies like Pyaasa and Sahib Biwi Aur Ghulam, few know that he wove satire and social commentary very well into his comedies. The legendary V.K. Murthy was the cinematographer, and even now you will love the way the actors, the director and the cinematographer come together to create the most expressive and luminous close-up shots throughout the film. It’s not just the dialogue and the screenplay by the final of the trio, Abrar Alvi, or the lyrics of the songs, but the slight arching of an eyebrow and the mischief in the eye that do most of the talking. It is no wonder that the Dutt-Murthy-Alvi team is still talked about as among the most creative trio that made Bollywood of the 50’s light up the way it did. The songs written by Majrooh Sultanpuri, composed by O.P. Nayyar, with most of them sung by Geeta Dutt and Mohd. Rafi are a class apart. They are hummable, have charming lyrics and are beautifully picturised. The variety, starting from “Ae ji dil par hua aisa jadoo” and “Thandi hawa kaali ghata” to “Neele aasmani” and “Udhar tum haseen ho” with a “Ab to ji hone laga” and “Chal diye banda nawaaz” thrown in, is quite nice. The actors are all brilliant. 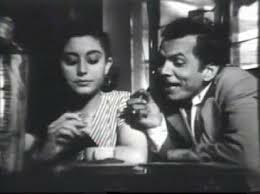 Even the supporting cast comprising of Lalita Pawar, Johnny Walker, Yasmin, Kumkum, Tuntun and a very young Jagdeep in a cameo execute their lines with panache and apt humour. What do I say about Guru Dutt and Madhubala? They are effortless and immensely likeable. It is a pity neither lived beyond 40 and it is sad we could not see them more than we would have liked to. If you’re lover of old Bollywood classics, I am sure you have watched this movie. 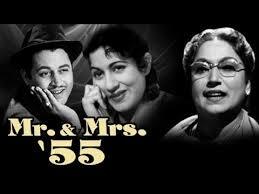 If you’re someone waiting to be inducted into Guru Dutt’s work, this may be the film to start with before you move on to his more sombre work.Even if you’re not much of an film aficionado, you will enjoy Mr. & Mrs. ’55 because it is a simple story and will appeal to everyone. A 24-hour long romantic relationship is not much to talk about. But when it includes a sense of incompleteness throughout, and the protagonists of the love story are keenly aware of the impossibility of their wishes coming true, there is a sweet poignance that makes it the one day of your life you will remember most fondly. I recently revisited Roman Holiday, one of my favourite Hollywood classics; it was one of the first DVDs I purchased when I began earning, and I have watched it far too many times to count. The delightful love story also told me that I was going to fall madly in love with Audrey Hepburn (anyone who has visited this blog in the past will know how much I adore her) and Gregory Peck, for whom I don’t know if their talents are superior or their looks are. 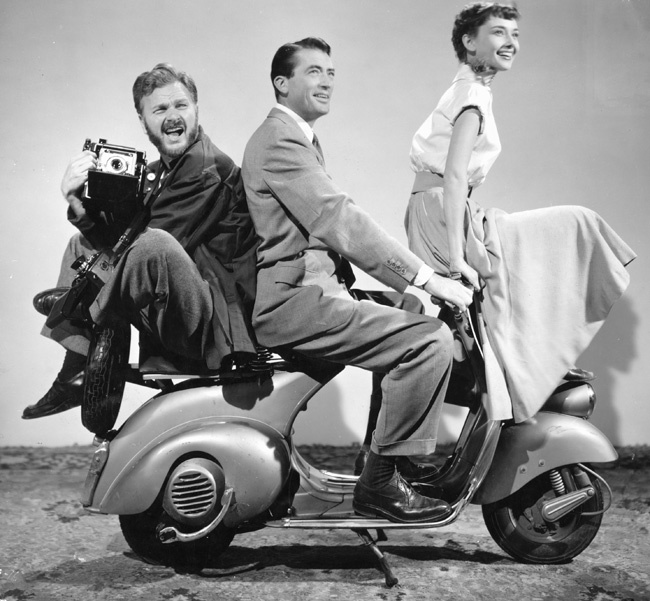 Now as an oft-repeated plot, which could be viewed as too simple for modern audiences that enjoy experimental and cult cinema, Roman Holiday is about stifled Princess Ann (Audrey Hepburn) of an unnamed European country on a goodwill tour of the continent. Longing for freedom and less stoicism in a life governed entirely by protocol and with no space for the occasional whim, she breaks down one night. Despite the sedative her personal doctor administers on her, she sneaks out of her embassy-lodging into the free world. She walks down the streets all by herself, she breathes in the sights, watches the sounds and tastes the smells till the sedative takes over and she falls asleep on a low pavement, mumbling a Keats poem incomprehensibly. Enter Joe Bradley (Gregory Peck) – An American journalist deputed in Rome, handsome, street-smart, and a strange but likeable mix of gentlemanly-cocky. He feels protective of the well-read, well-dressed “drunk” girl and ends up taking her home to keep her safe from goons. The brilliant first meeting establishes that neither knows who the other is. The next morning Joe finds out the identity of his guest and decides to make money by selling his scoop (an exclusive story about the Princess and her personal life) to his editor. He employs his shutterbug friend, Irving Radovich (Eddie Albert at his funniest) to take candid pictures of the royal person impersonating a commoner, enjoying the mundane things regular people take for granted, like walking on the streets incognito, getting a haircut, sitting at a cafe, enjoying a gelato by a fountain, and just visiting random places in the city. There are memorable scenes on an iconic Vespa, in a police station, on a boat, by the wall of wishes and at the mouth of truth, each as warm as the next, as Anya and Joe take the audience on a tour of the city. Now predictably, by the end of a very eventful day, Anya Smith (the princess changes her name to hide her identity) and Joe Bradley are in love and acutely aware that they cannot be together. With a heartbreaking goodbye they part ways; she still unaware that Joe is a reporter, and he, resolved to never share her clandestine escapade with anyone ever. They meet again, as strangers, and exchange coded messages, just like close friends sharing secrets in a public setting do. Princess Ann holds her position, duty, honour and responsibility as her nation’s ambassador very close to her heart, and no matter how tempting the prospect of a very normal and humdrum life with Joe is (their conversations just before they part make you ache), she knows she has a moral responsibility towards a life she was born into. Joe understands her dilemma and lets her go. He doesn’t sell his scoop on her, forgoes the five thousand dollars he was promised even though he needed the money, and gifts her a set of the candid pictures of her during her outing in Rome, all with a warm smile. The backward-moving tracking shot of him walking out of the grand hall where they meet the last time portrays how far out of his reach she is and will continue to be, and that he realises that and chooses to leave his dream far behind him and move on. 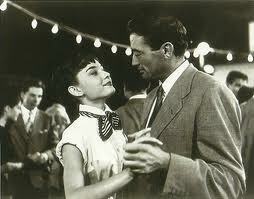 A naive and nubile Audrey Hepburn in her debut Hollywood vehicle earned her first acting Oscar from this film. The original screenplay by Ian McLellan also won an Oscar (in 1992, a posthumous Oscar was properly credited and given to blacklisted author Dalton Trumbo, who actually wrote the screenplay), quite understandably for the subtle messages they convey throughout the film with their sharp screenplay. The cues and clues are so “everyday” in their nature, they are hard to pick up in the first viewing. For example, when at Joe’s apartment, a slumber-induced Princess Ann struggling with her stoic and stifling upbringing asks him to help undress her, he only undoes her necktie. The necktie is symbolic of her straitjacketed life as royalty, and he removes it and takes her along on a day full of small pleasures of a life free of obligations of high-born, political nature. 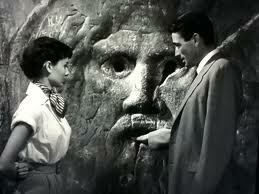 Roman Holiday is one movie I suggest everyone should watch. No matter what your sensibilities or cultural background, you cannot not like a film so dreamy, yet real.